Harker alumni are back on campus helping out and, incidentally, picking up a paycheck. Alumni have helped out as volunteers in the past but, this year, several were hired as paid employees and brought their Harker knowledge to the job. “We do big searches for administrative assistants,” said Chris Florio, the academic summer principal. “Finding the right person for the right job is so critical.” Along with administrative spots, several students are assisting with science and computer classes. While alumni have informally worked on campus in previous years, this summer was the first time they had to fill out applications and turn in stellar references. Florio has found the students they hired to be “great” and “inspiring,” saying he would “absolutely bring them back,” and most of the students said they’d love to return. Maddie Rao ’12 has had her first taste of a desk job and likes it. She’ll be attending Scripps College in the fall, and is considering majors in biology or foreign languages. Until then, she’s been working full-time doing library and attendance work for Harker. “I’ve learned a lot about time management and organization,” Rao said. She’s also enjoying helping students and the summer office assistant. Other alumni have had a chance to experience life from the other side of the teacher’s desk, so to speak. Akhil Prakash ’12 has been helping science students in the morning program from 8-11 and then tutoring students for an additional four hours a day and has really learned to enjoy the teaching process. He has helped fellow students in class as a student, but always had his own work to attend to, as well. He enjoys being able to devote himself to the students without that concern. 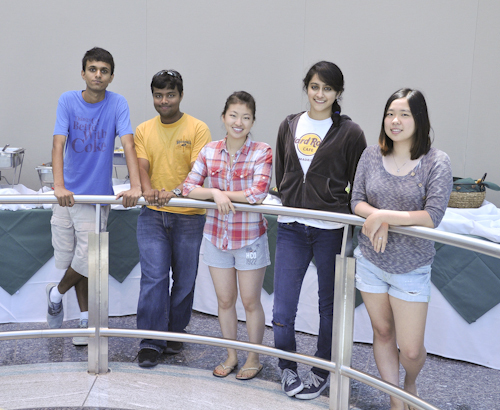 “You get to see peoples’ grades and really know who you need to help out,” Prakash said. “Sometimes people getting bad grades don’t want to speak up. This way, you can give them your undivided attention.” Prakash is going to Carnegie Mellon, where he will major in math or computer science. He’s enjoying interacting with students, and enjoying inspiring a love of programming in them. In addition to some one-on-one teaching, he also feels he’s learned how to communicate better. Lucy Xu ’12 has also gotten a glimpse of life from the other side of the desk. She’s worked 40 hours a week as a teaching assistant for science classes this summer before she heads to Brown University. “It’s different being a teacher than it was being a student,” she said. “As a student, you don’t realize how much forethought and preparation goes into [the science experiments]. All the little things you don’t consider.” Xu has helped with grading as well as lab work this summer. Sachin Jain ’12 is coming from a different angle, volunteering in science labs for three hours per day. He’d love to return next year as a paid assistant. Along with helping students and setting up labs, Jain has made several video tutorials teaching basic programming, which can be used during the school year to supplement classes. “There are so many different ways to write the code,” said Jain. He’ll soon be off to the University of Michigan, but for more than a month, he’s been on campus hard at work finding ways to explain programming concepts. Jeff Sutton, an upper school science teacher, has truly enjoyed having alumni as assistants. “They’ve been amazing,” he said. “We’ve had professional chemistry teachers come help in the past, but these gals are way better. They kind of know what we expect, and they grade on a higher level.” Because they know “the scene,” as Sutton put it, they’re conscious of their time and of what needs to be done next. “I really like having them in the classroom,” he said.